The Subsea Company announces specially formulated lubricants providing optimized protection in severe offshore environments. When offshore conditions are severe, the offshore industry needs reliable parts and working equipment coupled with the advanced technology to hold it all together. This month The Subsea Company announces another product launch with its new, specially formulated lubricants that will hold up in extreme offshore situations and provide superior anti-seize, wear & corrosion control properties. For over a decade, The Subsea Company (TSC) has been innovating solutions for Oil & Gas, Drilling and OEMs to help protect the environment and potentially reduce or eliminate equipment failure and unscheduled downtime. The company’s lines of Lubricants are designed to help companies save time and money by offering tremendous protection and overcome typical wear, corrosion and galling issues common in the marine environment. Manufactured for the diverse array of operating conditions found in oil and gas exploration and production, Subsea’s lubricant collection ranges from Subsea Greases developed environmental sensitive, extreme pressure or high load applications to Subsea Anti-Seizes, for Riser Bolts, structural steel and stainless which seal, protect and eliminate galling. Heavy Grind Subsea is a superior underwater grease due to its super tacky consistency that assures adhesion and sealing on wet surfaces and splash-zone for high load slow moving skid, bearing, gear and sprocket applications. It is compatible with most other lubricant formulas; however, best results are achieved by continuing use after the older lubricant has dissipated. 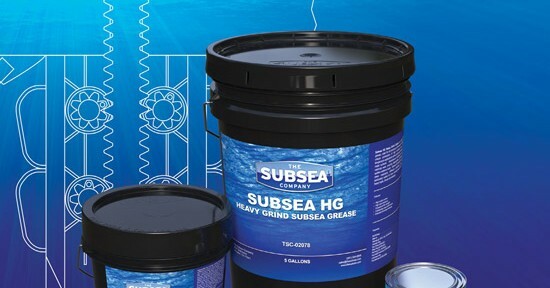 Another option for severe offshore applications is Subsea’s Extreme Pressure Corrosion Control Grease, which exhibits outstanding performance and is fortified with molybdenum disulfide to endure heavy loads and shock loading and contains no additives such as lead, antimony, zinc, barium, sulfur or phosphorous. This formula makes it more hygienically safe and environmentally friendly. Also, metal-free Subsea Anti-Seize products prevent electrolysis from occurring while sealing the entire contact surface from the environment assuring threads and fittings will never gall, no matter how tight you turn them. Subsea’s proprietary lubricant formulations combat corrosion, extreme pressure, heavy loads and offer seawater resistance resulting in unsurpassed performance. In addition to lubricants, this year The Subsea Company is launching certified pressure gauges and 16 variations of BOP Drifts into the market. For more information, please visit, www.thesubsea.com.